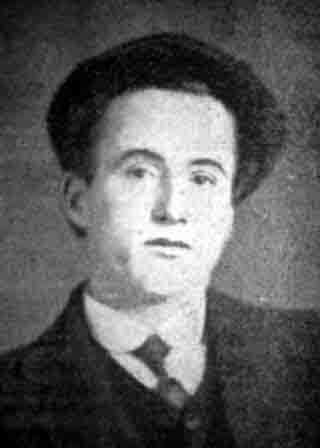 John Blackwell is the nephew of Joseph Blackwell also deceased following the War. Brother of George William Blackwell (deceased WW1 16th July 1916). 1896: Born 14th Jan 1896 registered Chapel-en-le-Frith Vol 7b Page 850 J/F/M. 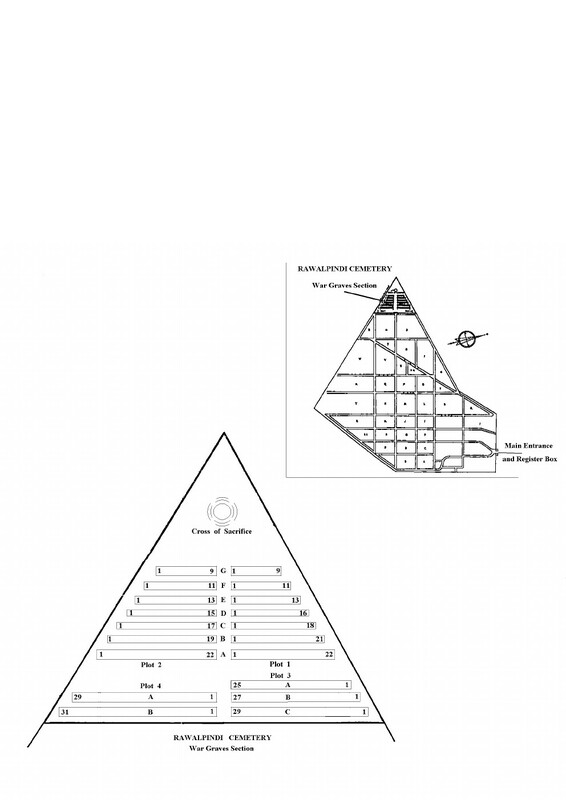 1901 Census: Living at 1 Dale view aged 4yrs. 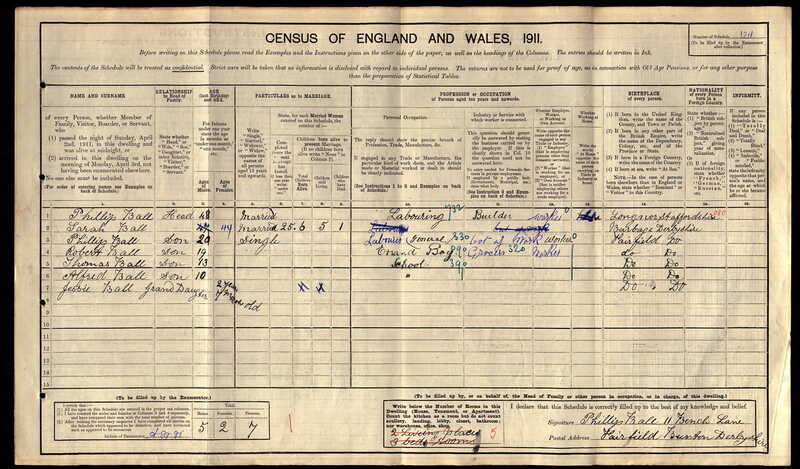 1911 Census: Living at 55 Fairfield Road aged 14yrs occupation Upholsterer. Mother Mary is a Widow with 4 boys. 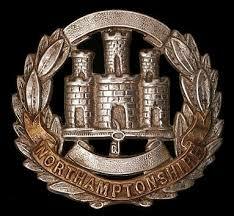 1915: Enlisted in 16th Battalion Notts & Derby Chatsworth Rifles aged 19yrs. The Service Papers show that he enlisted into the Sherwood Foresters (Notts and Derby Regiment) on 31st May 1915, at Buxton, where he was living at 15 Fairfield Road, aged 19 years 4 months. John left Southampton for France on 6th March 1916, landing at Le Havre the same day. 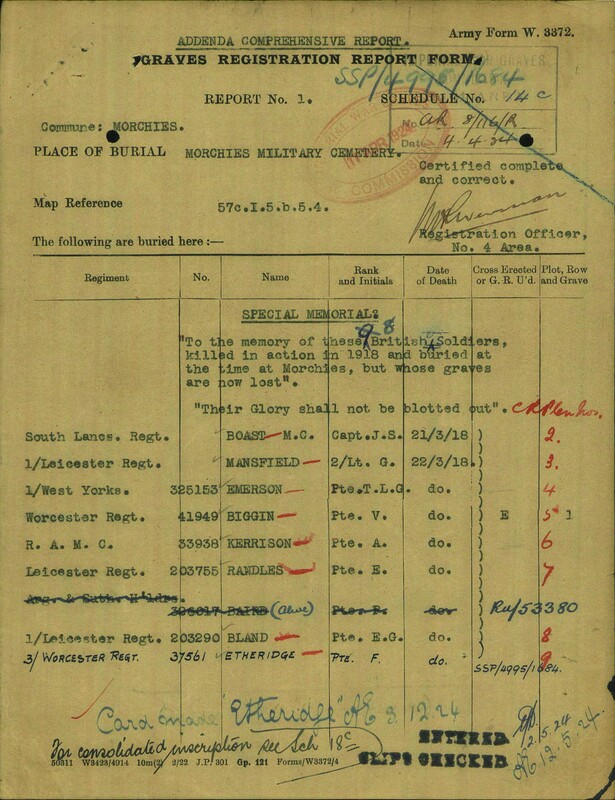 John was promoted to Corporal on 6th May 1917 after just 2 months John was killed in action. In all he served 2 years 65 days. 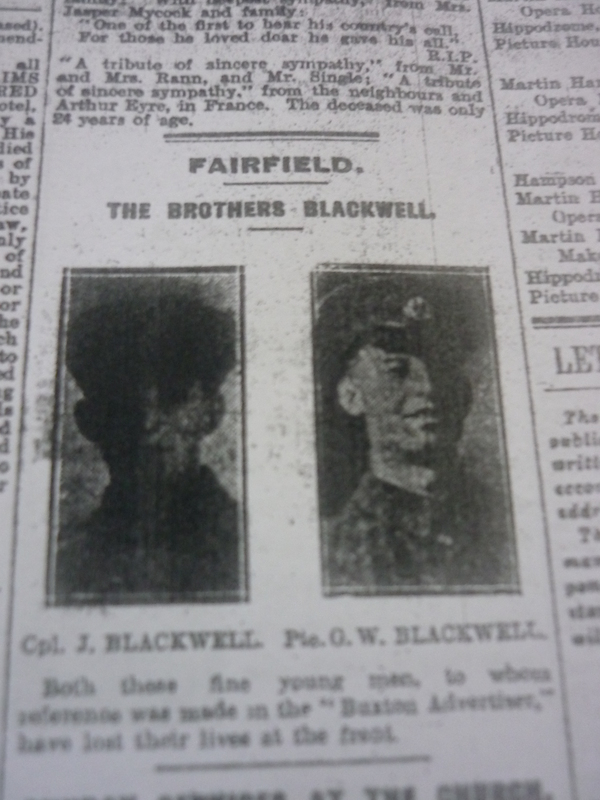 Brother of John Blackwell and the Nephew of Joseph Blackwell (both deceased WW1). 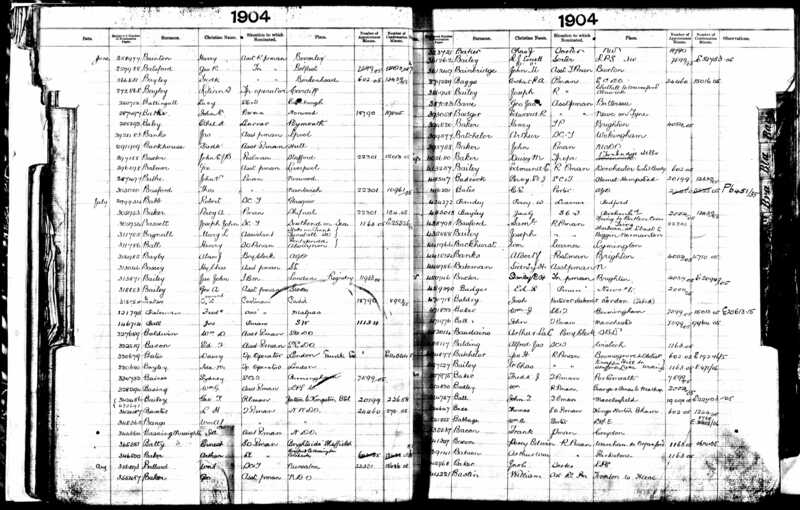 1894: Born 6th December at Edge Hill Liverpool Lancashire, George was christened at St Dunstans, Edge Hill on 30th December 1894..
1901 Census: Living at Dale View, Fairfield. 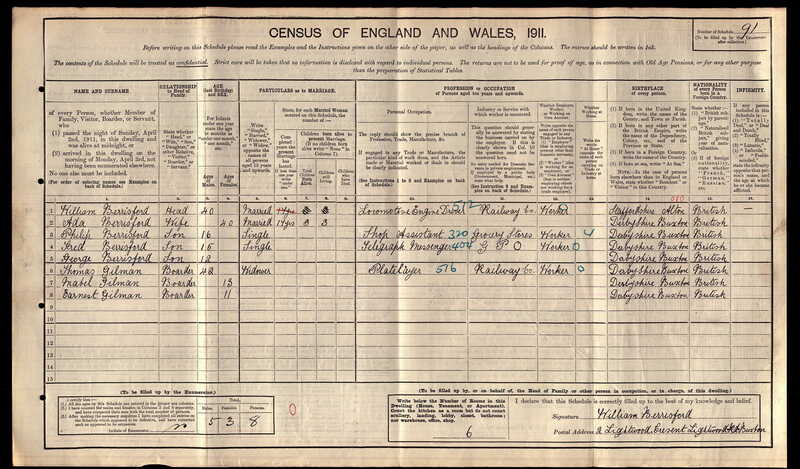 1911 Census: Living with Mother Mary a Widow @ 55 Fairfield Road aged 16yrs. Service was firstly with the Middlesex Regiment. 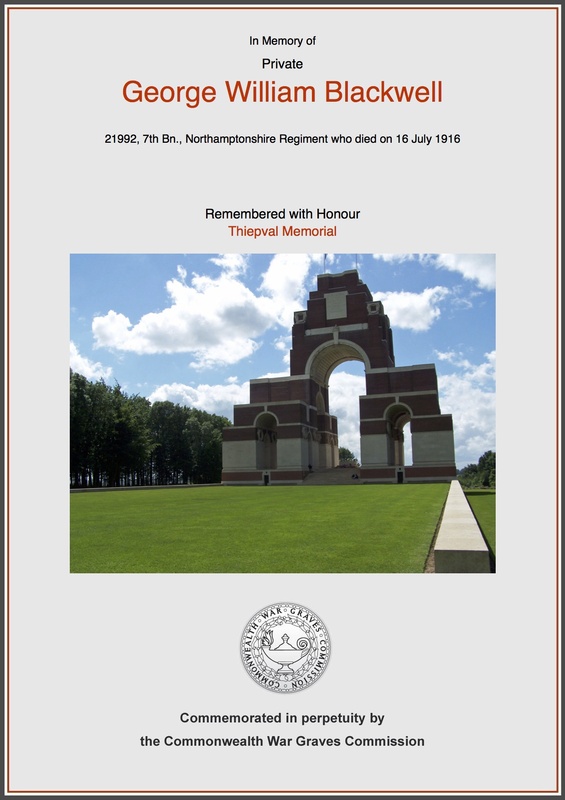 Service No: Pte 5808, Transferred to 7th Battalion Northamptonshire regiment Service No: 21992. 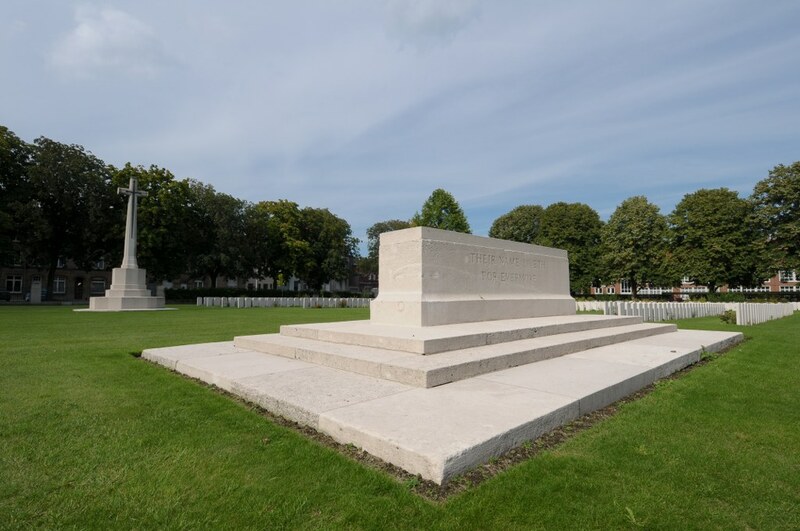 Commemorated @ Thiepval Memorial, Picardie, France Plot 11a, Face 11d. 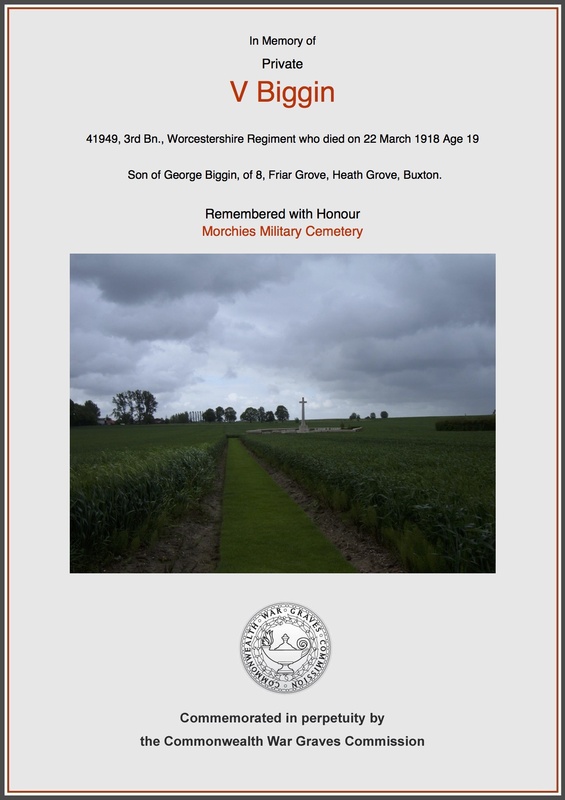 Georges younger brother John Blackwell, Corporal 266607 also lost his life in 1917, younger brother Alfred Pte 79279 served with the Somerset Light Infantry, there was also another brother Reginald. 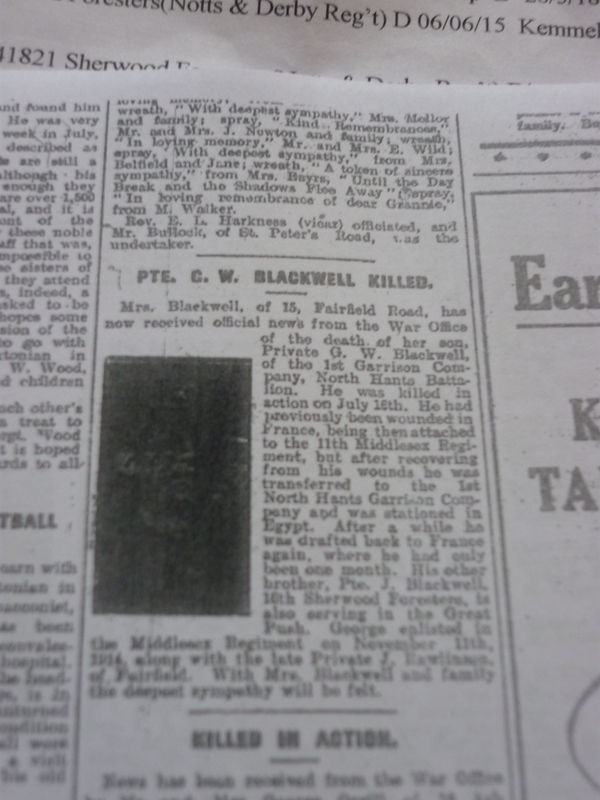 Mrs Blackwell, of 15, Fairfield Road, has now received official news from the War Office of the death of her son, Private G. W. Blackwell, of the 1st Garrison Company, North Hants Battalion. 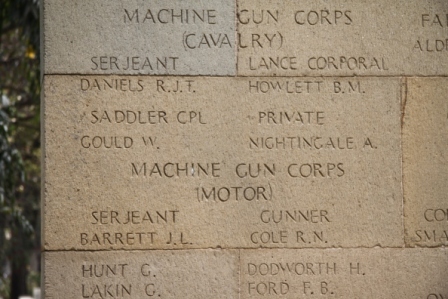 He was killed in action on July 16th. 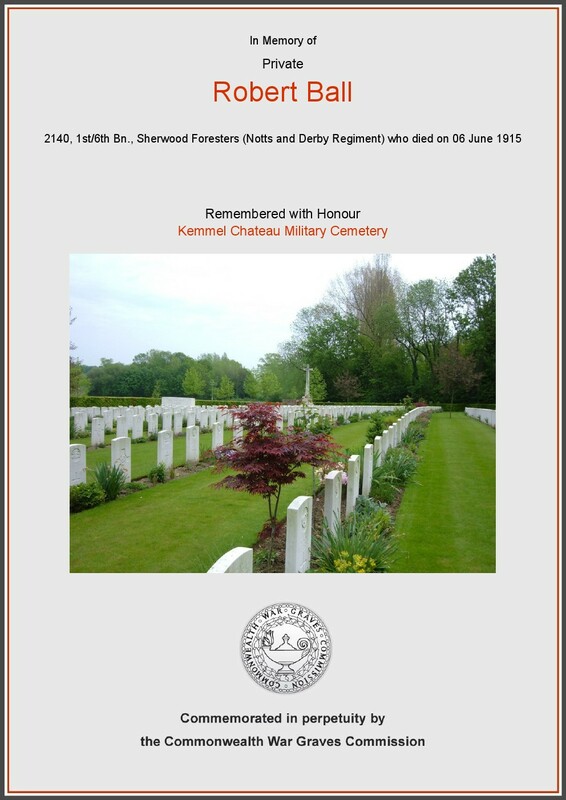 He had previously been wounded in France, being then attached to the 11th Middlesex Regiment, but after recovering from his wounds he was transferred to the 1st North Hants Garrison Company and was stationed in Egypt. After a while he was drafted back to France again, where he had only been one month. His other brother, Pte. J. Blackwell, 16th Sherwood Foresters, is also serving in the Great Push. 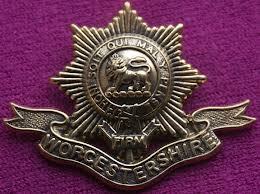 George enlisted in the Middlesex Regiment on November 11th 1914, along with the late Private J. Rawlinson of Fairfield. With Mrs Blackwell and family the deepest sympathy will be felt. 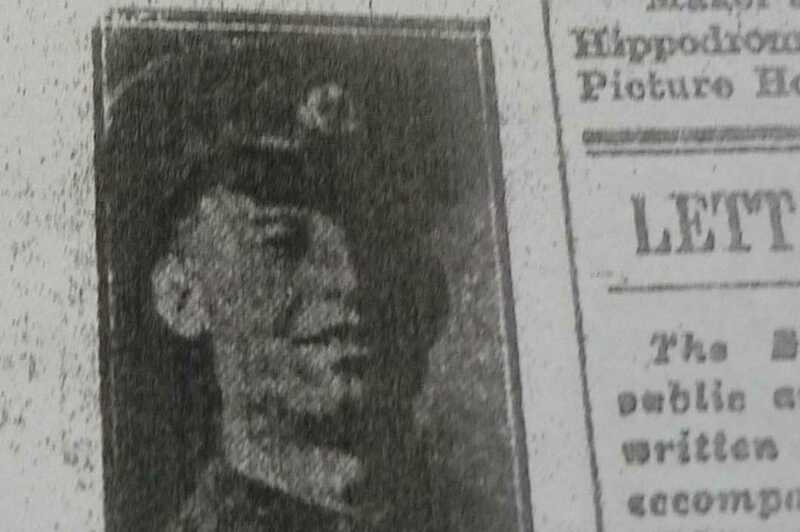 (‘Buxton Advertiser’ 2nd September 1916). The Inscription reads Dearly loved son of the above Fell in action March 22nd 1918 aged 19 at St Peters Church, Fairfield. 1899: born on 22nd January 1899 Chapel-en-le-Frith. Vol 7b Page 803. 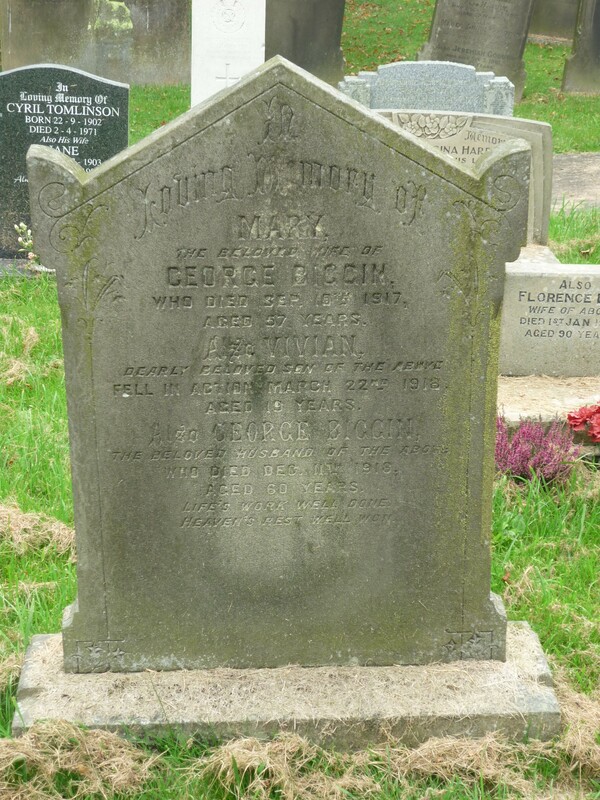 Father: George Biggin & mother Mary. 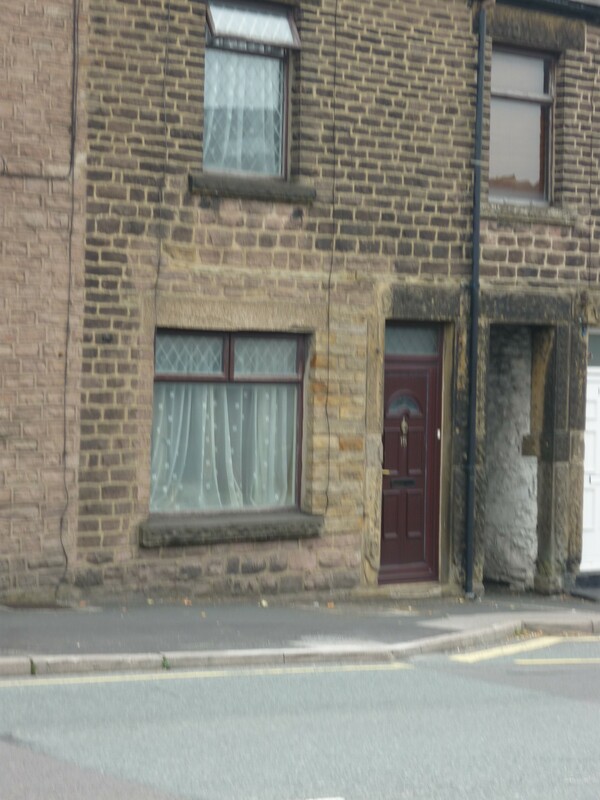 1901 Census: Living at 46 Bennett Street, Buxton aged 2yrs. 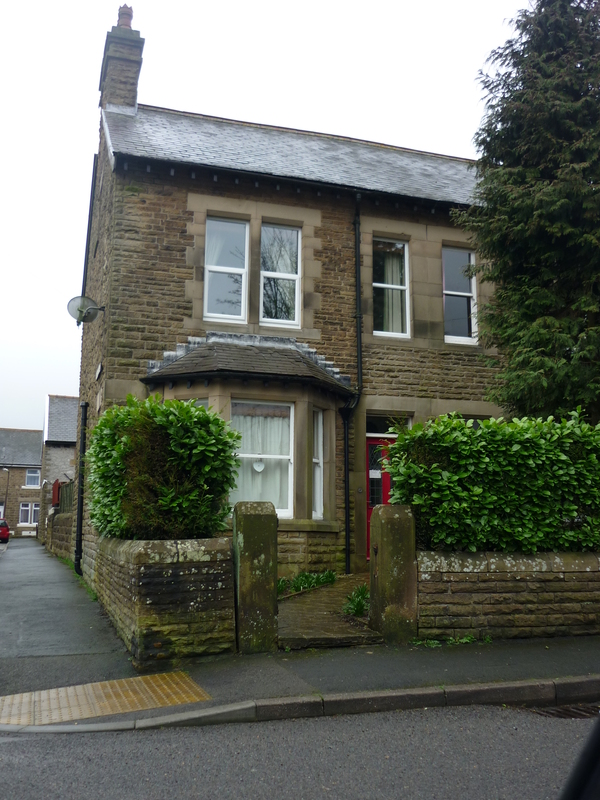 1911 Census: Living at 6 Marlow Street, Buxton aged 12yrs at School, Vivian attended North Road School as had his older brothers & sisters. Harriet Ann born 27th September 1887 started school 4th April 1892, Ethel born 23rd September 1888 and started school 4th April 1892, George born 3rd May 1891 & started school 10th march 1896, Percy Lindley 30th March 1894 started school 28th June 1897, Florence Elsie born1896 and younger brother Walter born 1902. 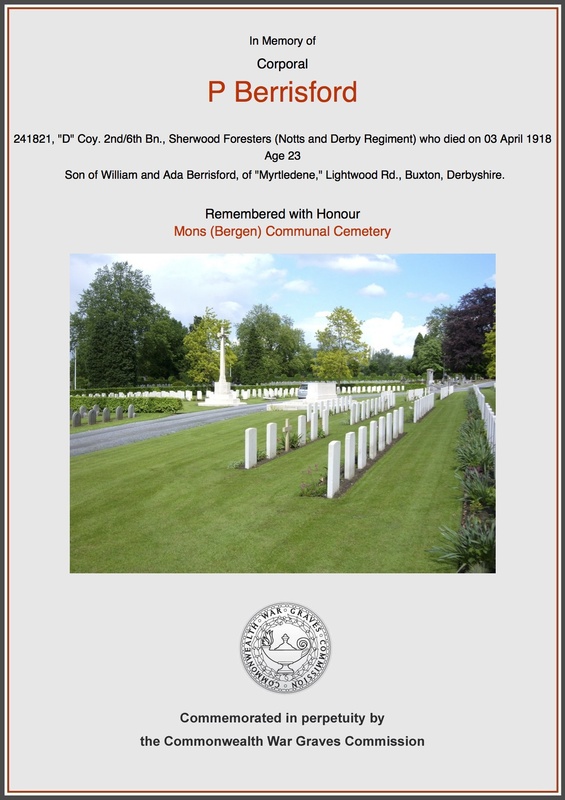 Percy Lindley Biggin also served during WW1, firstly enlisting into The ‘Sherwood Foresters’ Pte 26352 he then transferred to the Leicestershire Regiment Pte 60808 and lastly Lancashire Fusiliers Pte 65086 from where he was injured and subsequently received the SWB No 494881. 1894: born 30th June 1894 registered Chapel-en-le-Frith Vol 7b Page 748 J/A/S, son of William & Ada Berrisford. Phillip was the oldest of 3 boys his brothers were Fred born 26th March 1896, started school on 22nd May 1900 & George born in 1899. 1901 Census: Living on Alma Street Fairfield aged 6yrs. 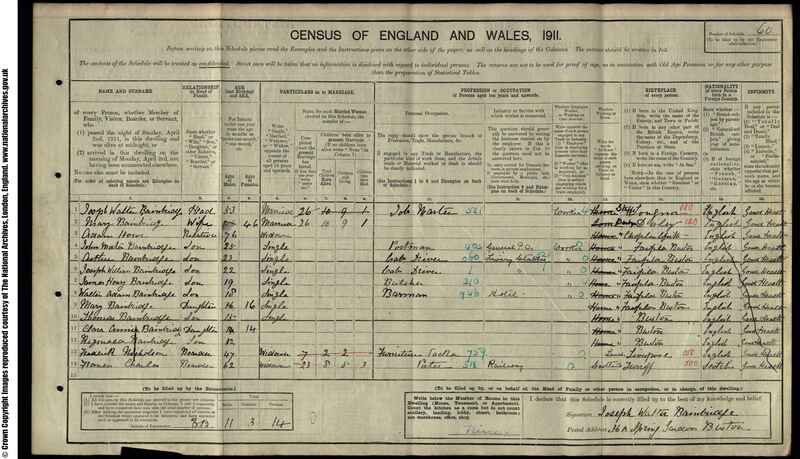 1911 Census: Living at 2 Lightwood Crescent age 16yrs. Occupation: Shop Assistant at Grocers. Military: Promoted to Corporal. Service No.241821. The 2/6th formed at Chesterfield on 14 September 1914 as a second line unit & moved on 2nd November to Buxton, the battalion HQ occupied the Empire Hotel. 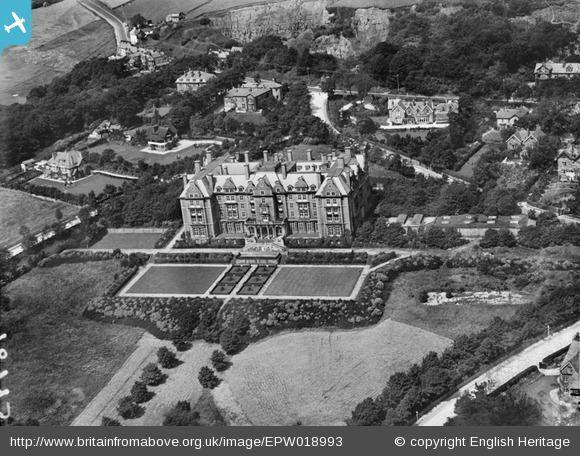 1918 Address: ‘Myrtledene’ Lightwood Road. Born: 1878 in Horwich End in Fernilee Parish, Whaley Bridge. 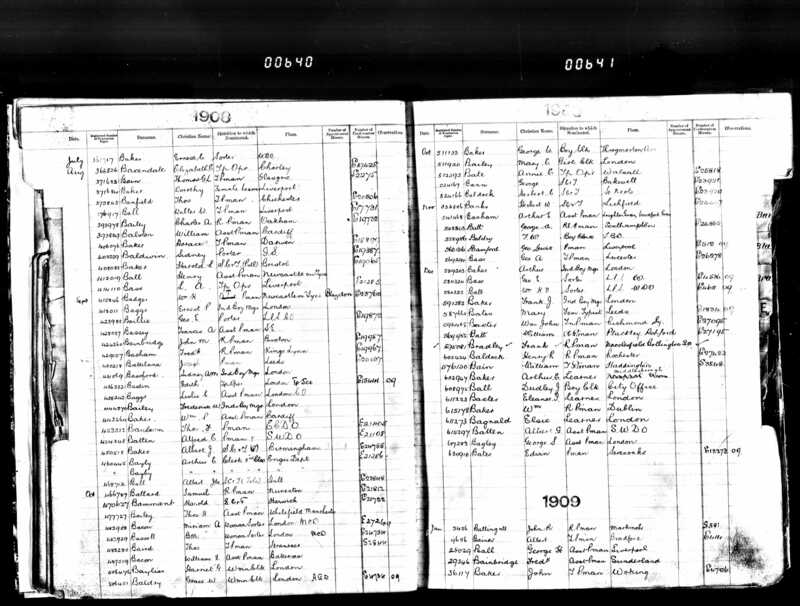 1881 Census: Living in Horwich End, Whaley Bridge aged 3yrs. 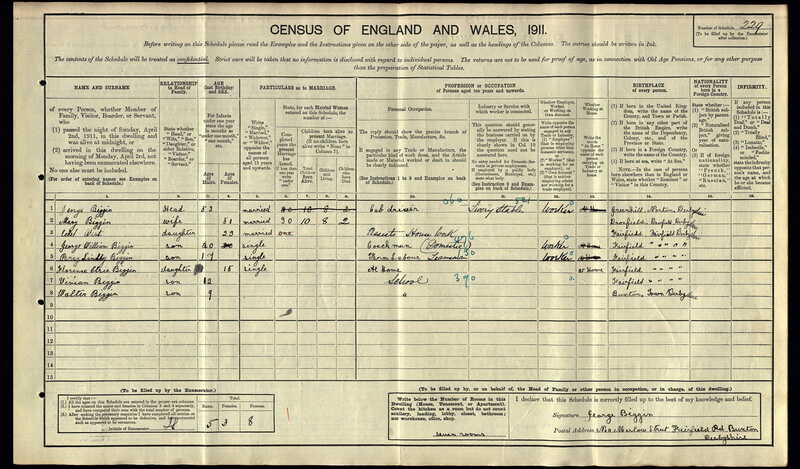 1891 Census: Living at Fern Bank Farm, Horwich End aged 13yrs at School. 1901 Census: Living at 1 Wesley Terrace, Fairfield. 1911 Census: Living at 33 Queens Road, Fairfield. 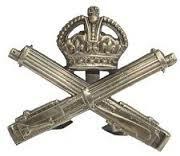 Served in the MGC as a Gunner Service No: 625 Promoted to Corporal. 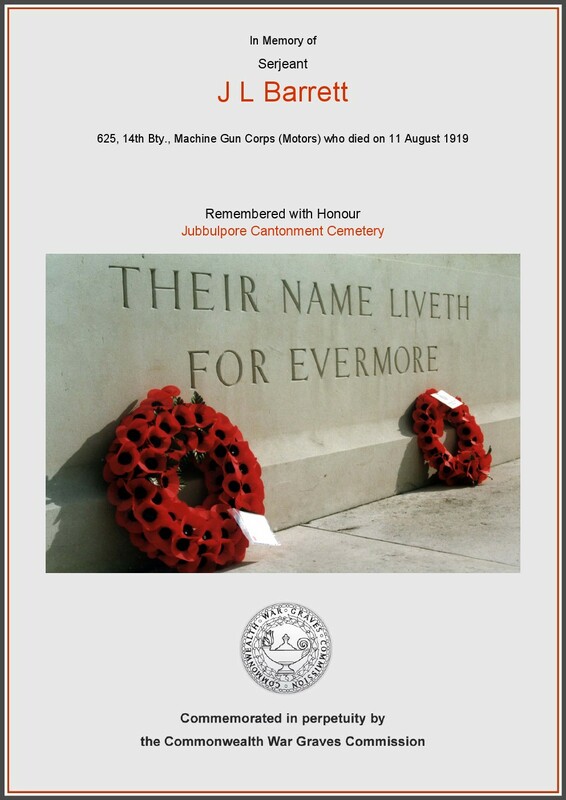 Death: August 1919 in Jubbalpore, India. It will come as a great shock to Fairfield residents to learn of the tragic death of Driver James Barrett, elder son of Mrs S Barrett, of Conway Villas, 33 Queens Road, Fairfield. A cable was received from his Commanding Officer in India last Monday conveying the sad announcement that her son had been drowned. It will be remembered that before joining his Majesty’s Forces James Barrett was a postman at the General Post Office, Buxton. Always a clever mechanic and skilful in motor work, he joined the Motor Corps and served in the war. He was not long ago home on leave. Of a bright, cheery disposition and a favourite with his fellows, his untimely end will be lamented by a large circle of friends. Mrs Barrett will while mourning the loss of a beloved son, have the satisfaction of knowing how highly he was esteemed. To the bereaved will be extended the deepest sympathy. Probate records give the date as 8/8/1919 Service records give the date as 11/8/1919. Cause of death ‘Accidental Drowning’. 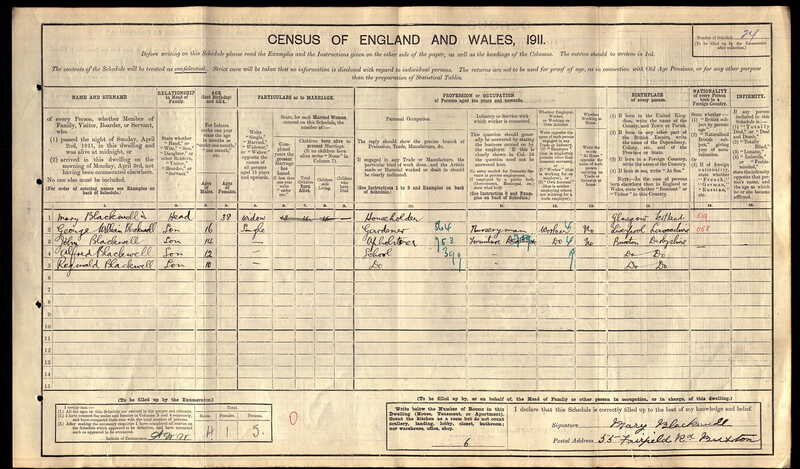 1901 Census: Living at Under 1 Rutland Terrace aged 9yrs. 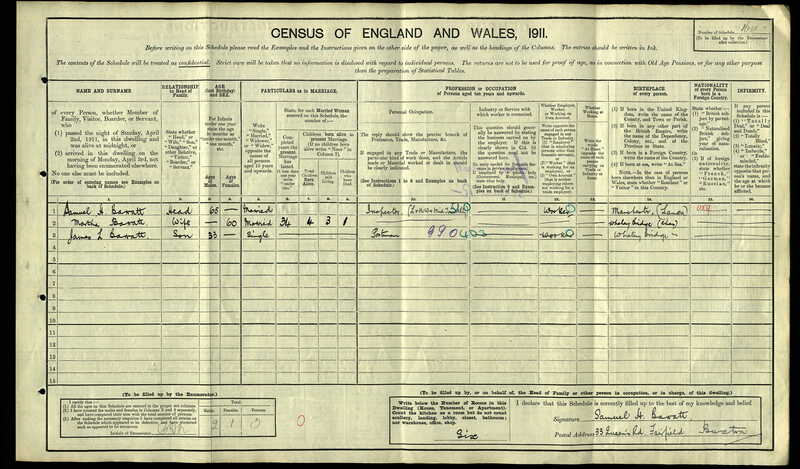 1911 Census: Living at 11 Bench Lane, Fairfield aged 19yrs. Occupation: Errand Boy for Grocer. Robert was the second eldest of 5 children. 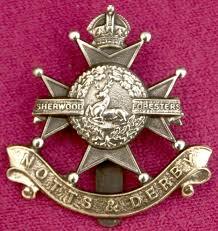 1914: Robert enlisted in March 6th Battalion Notts & Derby Pte.2140. Robert gave his occupation as a Fireman, he was employed by London & North Western Railway Company. Aged 22yrs. Robert arrived in France on 28th February 1915. On the 28th September 1915 following his death Robert’s personal effects were sent to his Mother Sarah Ball of 11 Bench Road, they included his Prayer Book, Letters & Photographs. 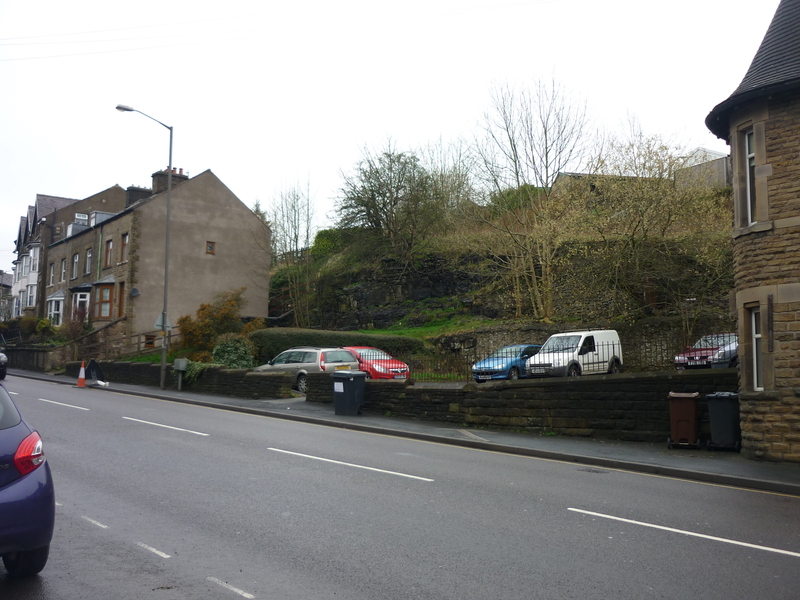 Upon enlistment Robert had 3 older brothers Benjamin (36) living on Alma Street, Joseph (34) living at Devonshire Cottages & Phillip (31) living at Southfield Terrace, there were 2 younger brothers Thomas (23) at Townhead and Alfred (20) living at home 11 Bench Road. 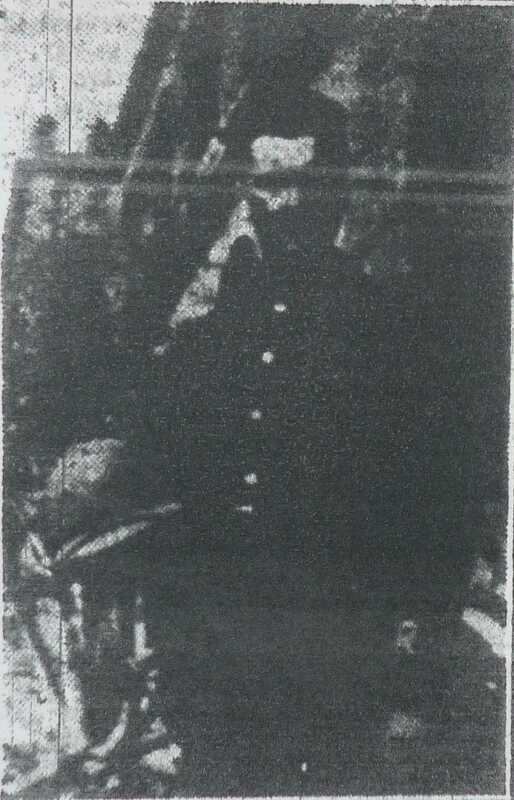 Private Bainbridge photograph sent to Buxton Advertiser on 29th June 1918 following his death in India which had been reported earlier. 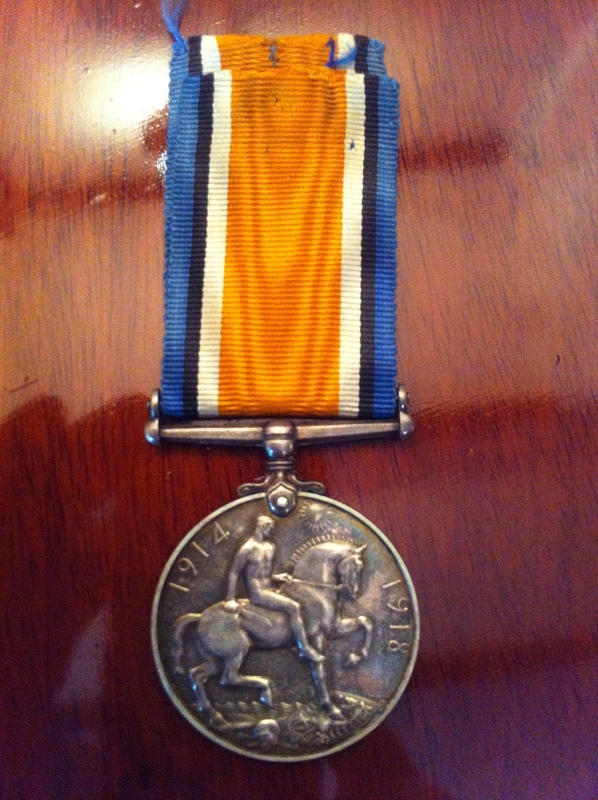 John’s original WW1 Medal (2014) brought by a private collector. Born: 3rd June 1885 in Fairfield one of 9 Children. 1901 Census: Lived @ 34 & 36 Spring Gardens Buxton. Father: Joseph Walter Bainbridge a Coach Proprietor. 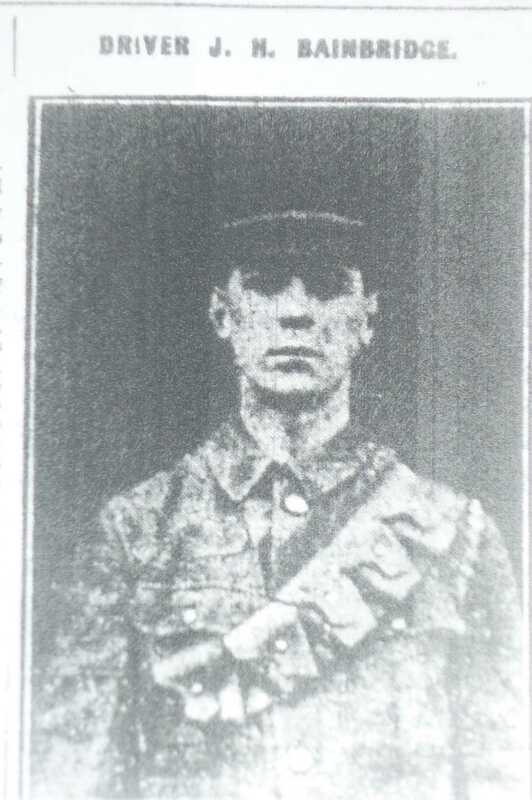 1902 John was a Trainee Postman in Buxton. 1904 John was an Assistant Postman in Buxton. 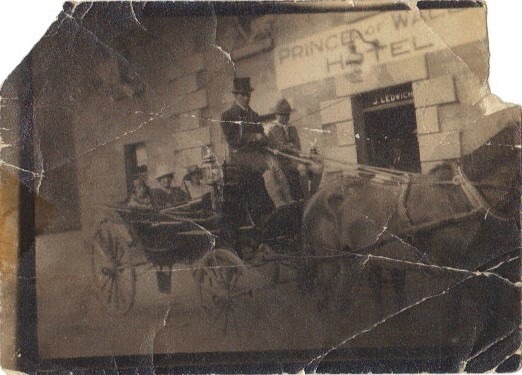 1907 John was still employed as a Postman in Buxton. 1908 Postal records show John was still employed as a Postman in Buxton. 1911 Census: Living at 36a Spring Gardens aged 25yrs. 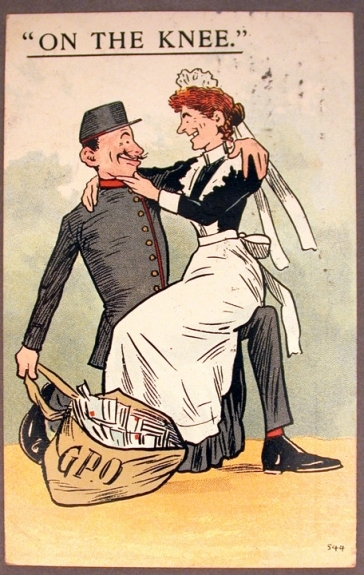 1915: Attested 18th September. Private DM2/129563. 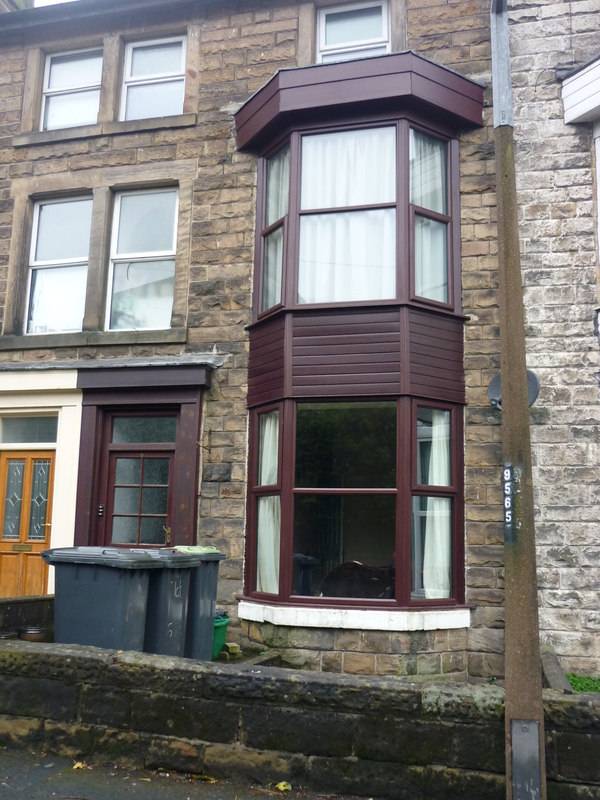 1915 address 8 Fairfield Road aged 30yrs 3mths.